This modern arc floor lamp with brushed nickel finish provides great multi-purpose lighting. This elegant arc floor lamp can add more light and style to your space. With a beautiful brushed nickel finish and soft linen shade, this floor lamp offers a sleek upgrade to the look of living rooms, seating areas and more. Use it for overall room illumination as well as a reading task lighting. 75" high overall. Drum shade is 15" wide x 8 1/2" high. Base is 12 1/2" wide x 2" high. Weighs 29.3 lbs. Uses one maximum 150 watt standard-medium base bulb (not included). On-off foot switch on the cord..
From the center of the pole to the outside edge of the shade is 50". From floor to bottom of shade is 60". A modern arc floor lamp design from the 360 Lighting brand. Brushed nickel finish. Off white linen shade. 8-foot long silver cord. to arc over dining table. high ceiling provides no lightening. perfect solution. Just what I have been looking for. Needed a task lamp nice looking and a good price. I'm hoping this will fit in my living room. I just broke a lamp on one of my end tables. Moving soon and changing decor. 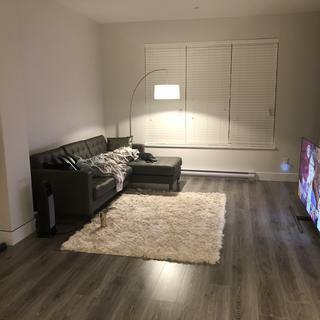 I have wanted to purchase an arc lamp to compliment my glam living room theme. 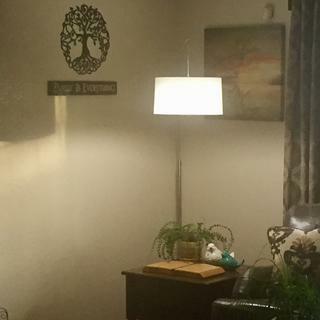 I needed a functional lamp, so that we can read while enjoying our fab new surroundings! My other light sources are lovely, but not actually very functional for tasks. 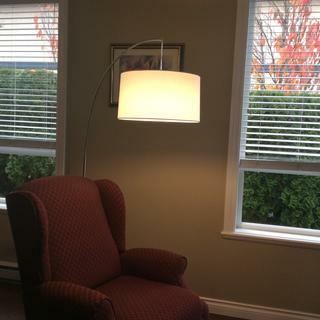 It is simple and just what I was looking for to keep the cord out of a walkway, the lamp will hang over a reclining chair and we can walk under the arc! Can I use LED light bulb for this light? what's the max. watt for LED light bulb? BEST ANSWER: Yes, you can use an LED bulb with a 150 watt incandescent equivalency. BEST ANSWER: This lamp currently only comes or pairs with the off-white linen shade. Does it have a diffuser? BEST ANSWER: Hi - No, this does not feature a bottom diffuser. Can you delivery to Korea? BEST ANSWER: Hi - This uses one maximum 150 watt standard-medium base bulb. Does the arm actually swing without moving the base? BEST ANSWER: Hi - Yes, it can swing side-to-side without moving the base. Is it displayed in store near 94531? BEST ANSWER: Hi - I am sorry, this floor lamp is currently not displayed at your local stores. Can I used an LED lightbulb? BEST ANSWER: Hi - Yes, you can use a standard/medium base LED light bulb. Is the arc portion adjustable? BEST ANSWER: Hi - the height of the arc is not adjustable. How far over is the shade from the base of the base? BEST ANSWER: Hi - this measures approximately 37 1/2" from base to the outside edge of the shade and 22 1/2" from base to the shade. Where on the cord is the foot switch located? I need to make sure I can access it since the lamp will be behind my couch. BEST ANSWER: Hi - from the base to the switch measures 24" and from the switch to the plug measures 76". BEST ANSWER: Hi, the floor lamp is stable. When placed on carpet it can be slightly wobbly depending on how thick the carpet is. 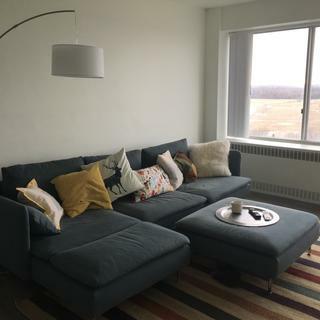 What replacement lamp shade should i buy? BEST ANSWER: This includes an UNO shade and I have added a link below to our available UNO shades. Please feel free to contact one of our knowledgeable Lighting and Home Décor Specialists who can provide you with some fantastic advice and possible other options. I want to purchase the Cora arc steel floor lamp. Is there much to put together and how difficult? BEST ANSWER: Hi, the assembly of the floor lamp is very easy. Not much needs to be put on. where is the "on/off" switch? BEST ANSWER: It is located on the floor attached to the cord. On the wire that plugs into the wall; sits on the floor. IMO, it is too close to the lamp when this lamp is placed behind a chair, otherwise it is fine. Hi, how big would the delivery box be? BEST ANSWER: Hi Jeremy - the box measures 18"L x 17"W x 18"H.
BEST ANSWER: It’s not adjustable. What are the dimensions of the arc? I'd like to use this over my dining room table and I'm curious to know how far it'll extend over the table. BEST ANSWER: Hi, from the center pole to the outside edge of the shade it measures 50" deep. 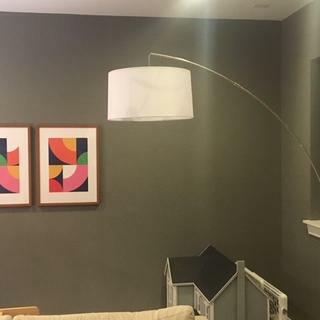 Can this floor lamp hang over a table? BEST ANSWER: The floor lamp can be placed to hang over a table. SO HAPPY WITH MY LAMP!!! I was looking for a simple and elegant amp that would provide light in the center of my apartment and over my couch. Working out the wattage in the bulb, but now I have no trouble reading at all! Also SO SIMPLE to assemble!!!! It is perfect for our small dining room that has no ceiling light. I love the switch that it operated by my foot on the base of the lamp. Very happy with the lamp. Excellent floor lamp for the price. This lamp is beautifully designed and brings a modern look to my living room. I’m very happy with the features-including the press switch on the bottom. Beautiful it’s everything I wanted!!! I love the lamp...but the dimensions seem off. 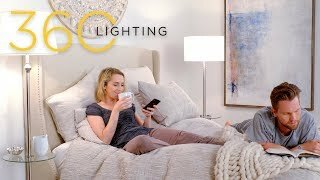 I have been shopping for a lamp like this for awhile. I had even ordered one from another company...only to be really disappointed. When this lamp arrived, I could immediately tell it was higher quality. It was sturdy even on carpet, and it was easy to put together. However, it doesn't fit into my space according to the dimensions advertised. The product description listed 60" (5 feet) from floor to bottom of shade. With my lamp, the bottom of the shade is at least 68" from the floor. It seems like the pole for my lamp is not angled the same way...thus making my lamp a lot higher in the room. If you look at my picture, the pole on my lamp slopes up to the shade and cord. But in other pictures on your site, it slopes back down near the shade. I'm wondering if I assembled something incorrectly...or if every lamp is shaped slightly differently. Notice how the angle / arc of my lamp pole differs from the angle / arc of the pole in the display. Hi Bridget D., we appreciate the review. Our customer service team would be happy to look into this issue with you and provide some troubleshooting tips or other solutions. You can reach them via phone, email, or chat. Thank you. 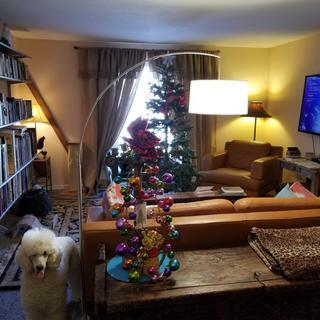 I am very pleased with the arching floor lamp we purchased. We have been looking for a reading light over our bed. The quality and finish is as described. It was well packed and arrived securely. The recommended 60 watt bulb was too bright for what we needed and use a 25 watt which is perfect for our needs. Cool lamp - it seems a little unfinished the way the shade hangs from the power cord that comes out at the top of arch- adds nice height dimension & modern touch to a room. It’s a nice lamp, it just doesn’t function as I wanted it to, which is as a dining table lamp. Perfect size and super easy to assembly. Love it! Love this lamp! Had no issues with delivery! Great price! Just what I was looking for! Just live it and the light in that room! What a sleek beautiful lamp! It’s part of my nesting corner. This is awesome floor lamps! Beautiful lighting love it! Would highly recommend this lamp --- very nice quality at a very affordable price! Great alternative to a pole lamp. I added a dimmer switch and the 100 Watt LED bulb to make it as functional as it is stylish. This lamp was easy to put together and looks beautiful in my office! This lamp was better than I expected. The quality of the lamp is excellent. The metal pole is a nice thick quality, not a cheap tin. The Lamp has a floor switch you just step on to turn on or off. It was easy to assemble, and looks GREAT! I have 22 foot ceilings and no way to install a dining room light without hiring a guy to put a hole in the ceiling and drag electric wiring down the wall to hide everything. This was a great solution since the arch of the lamp is wide and the lamp is tall.The base of the lamp is heavy so it won't tip over. LOVE it! Thanks Lamps Plus for the quality and the price. Nice lamp, has more plastic clear wire than expected from the shade to the pole. Hi Dan D., sorry to hear that your lamp arrived broken. We do encourage our customers to inspect their items so they can be sure that they can enjoy their items. However, our customer service team would be happy to provide other assistance and solutions for you. Could you please reach out to them via phone, email, or chat? Thank you. It was exactly as advertised. Very old quality.